Amazon introduces a trio of new tablets including the £50 Fire | What Hi-Fi? Apple may have just released the iPad Pro, but Amazon thinks its new budget offering can deliver just as much on the entertainment front for a fraction of the cost. The Fire is a 7in tablet with an IPS display, quad-core processor, front- and rear-facing cameras, up to 128GB of storage by microSD card, and a seven hour battery life, for just £50. Amazon says the Fire offers the best display in its price bracket and has two times more processing power than the Samsung Galaxy Tab 3 Lite. It also claims it’s almost more rugged than the iPad Air. It runs on Fire OS 5 Bellini and offers access to Amazon-exclusive features such as Mayday Screen Sharing - a free service that lets users get on-screen help from Amazon experts - and more than 38 million songs, movies, TV shows, books, magazines, Android apps and games. All Amazon content can be stored in the cloud at no extra cost to the user. Other services include X-Ray, which provides extra information relevant to the content being watched, and On Deck, which automatically provides the most up to date listings on Amazon Prime. And all of this in a tablet that costs just £50. Amazon will also be running a buy-five-get-one-free six-pack for £250 when it goes on sale on the 30th September. 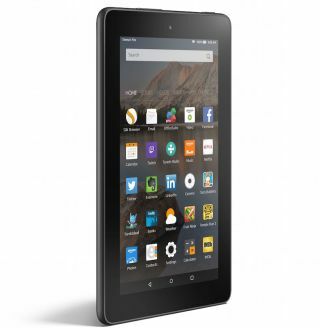 You can pre-order the Amazon Fire here. The Fire HD will come in 8in (pictured) or 10.1in variants. Amazon says it’s been redesigned from the ground up with particular attention paid to its entertainment credentials. Both tablets come with a Full HD 1080p display, quad-core processor, stereo speakers with Dolby Audio support - including Dolby Atmos - and up to 128GB of expandable storage by microSD card. There's a 5MP camera on the back, while a front-facing camera can be used for 720p video chat. The tablets are the thinnest (7.7mm) Amazon has ever produced and, at 432g, the Fire HD 10 is lighter than an iPad Air. The new Fire HD also comes with the latest iteration of Fire OS: Fire OS 5 Bellini. Amazon says this brings with it the “best entertainment experience on a tablet” thanks to a new user interface and heavy integration of Amazon-exclusive services. A new On Deck feature automatically updates the latest Prime Video content, including Amazon Original Series. If users decide to download Prime content, the tablet will automatically make room for it. The Word Runner feature is claimed to help users increase their reading speed by putting each word at the centre of the screen. It learns the preferred reading speed, but can even slow down for difficult words, punctuation and paragraph breaks. The Amazon Fire HD 8 will be available in 8GB or 16GB internal storage options and in four colours: black, magenta, blue and tangerine. The black version will begin shipping on 30th September while the other three colours will be available from 6th October. You can pre-order the Fire HD 8 from £130 here. The Fire HD 10 meanwhile will be available with 16GB or 32GB of internal storage in black or white. Black will ship from 30th September while those who want white will have to wait until 30th October. It can pre-ordered from £170 here. Finally, the Fire Kids Edition joins the Fire HD Kids Edition released in June 2015. The model is more affordable and comes with a new child-friendly web browser, updated child-proof case and one year of Fire for Kids Unlimited. Kids Unlimited gives access to books, videos, educational apps and games that are all age-appropriate - and free. Amazon also supplies the tablet with a two-year worry-free guarantee which means Amazon will replace it without charge if it gets broken. The Fire Kids Edition also features a quad-core processor, front- and rear-facing cameras and up to 128GB of expandable storage via microSD card. It will be available in pink or blue for £100 when it’s released on 30th September. The Fire HD Kids Edition is still available for £120. Amazon’s Fire offering now stands at seven tablets: Fire; Fire HD 6; Fire HD 8; Fire HD 10; Fire Kids Edition; Fire HD Kids Edition and the Fire HDX 8.9.